Toronto geologist Alar Soever was going through a divorce early in 1996 when he first encountered the Federal Child Support Guidelines which recommend amounts non-custodial parents should pay for child support. "My lawyer couldn't tell me how the figures were arrived at," he recalls, "so I contacted the federal Department of Justice which said that the document to explain the formula would be published in the fall of 1996. That made sense, since Parliament was going to debate the guidelines that winter." Mr. Soever then telephoned every two months, but the guidelines were never "ready." The controversial guidelines were passed by Parliament in February 1997 and came into effect two months later. The research report (CSR-1997-IE) which explained the formula was not released until 14 months after Parliament's decision. 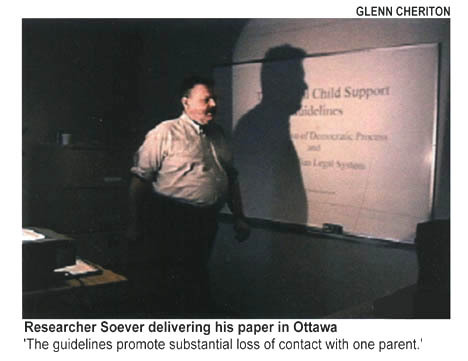 Mr. Soever is a methodical man, and was intrigued by a number of issues, including how regulations affecting the lives of hundreds of thousands of divorcing parents could have passed without any public documentation as to how the guideline amounts were calculated. To find out, he undertook four years of investigations. On April 5 he released his findings to an Ottawa forum, Toward Shared Parenting, co-sponsored by the Family Forum of Ottawa and the National Alliance Advocating for the Needs of Children and Parents. His 31-page document was titled "The Federal Child Support Guidelines: A Breakdown of Democratic Process and the Canadian Legal system." According to B.C. resident Ross Bailey who attended the meeting, "Alar's paper has the whole non-custodial and grandparenting community across the country buzzing because they knew something was wrong with the guideline formula, but needed someone to tell them how it was wrong." That community may buzz even louder with the news that last week, among materials obtained by Liberal MP Roger Gallaway through the Freedom of Information Act, Mr. Soever finally found an explanation of the guidelines which had been prepared in the fall of 1996. He believes the explanation was repressed because it gives examples of the financial consequences of the guidelines, "transparently indicating how unfair the formula is" (see story, p. 54). One of those to whom he revealed the document compared the situation to the "tainted-blood scandal," in which the government's suppression of information caused irreparable damage; "By not telling the judiciary what the formulas really meant, they caused serious harm which has included driving people into bankruptcy and even suicide." As a geologist, Mr. Soever examines mineral reserves to separate the truth from self-serving hype, checking assumptions, formulas and calculations. "When I examined the guidelines," he says, "I realized it was like the Bre-X scandal, complete with flawed assumptions and skewed calculations. It was driven by psychology, with everyone thinking it was child support so it must be good, but it's actually promoting custody battles and hurting children. The bottom line? No one appeared to have done the due diligence on the underlying formula." He ended with a stunning question: "How is it that in a democracy we can have guidelines which contravene the Divorce Act, are based on a largely unknown, admittedly deficient formula, and are derived from undisclosed policy decisions that promote the loss of substantial contact with one parent?" What Mr. Soever learned is that the guidelines as implemented contain not only child support but spousal support, (which contravenes the Divorce Act), and overestimate expenditures on children for the custodial parent while underestimating them for non-custodial parents. That conclusion is also reached by University of Calgary sociology Ph.D. student Paul Millar (http://www.canadianfamilyresearch.org), in research to be published in the June edition of the peer-reviewed academic journal, the Canadian Journal of Law and Society. The incomes of the paying and receiving parent are assumed to be equivalent. In those cases where these assumptions match reality, the model does meet its objectives: equal standards of living and sharing of expenses between the two parents. In practice, however, the amount of time that the non-custodial parent has custody of the child can range up to 40% (when over 40%, the guidelines do not apply). Among parents with average incomes, if the paying parent spends no time with the children and thus has no expenses, his standard of living tends to be 16% higher than the receiver's. If, however, the paying parent is an involved one, he or she has expensesoften almost as high as the other parent's. Yet the guidelines deny recognition of this. 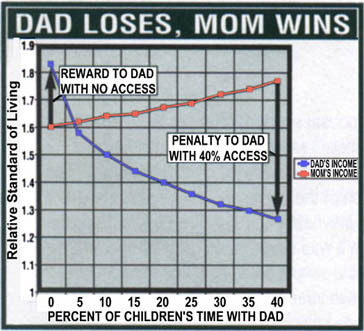 In fact, Mr. Soever has determined, if the parents have average incomes, once custody exceeds 5% (roughly one night every two weeks), the noncustodial parent and the children when they are with him are penalized with a lower standard of living than in their other home. Once custody approaches 40%, the standard of living in that home is almost 30% lower than in the other home, and barely above the poverty line. In other words, concludes Mr. Soever, the more time children spend with their divorced non-custodial father, the poorer he gets and the more difficult and impoverished their time together. "The guidelines," he says, "offer clear and powerful financial disincentives to joint parenting by penalizing those payor parents with substantial custody. Most perversely, parents who abandon their children are actually rewarded with a higher standard of living than the children they abandoned." A further by-product of the guidelines, the researcher says, is that they encourage custody battles as parents strive for the magical 40% threshold, and the benefit to the custodial parent is lost. Mr. Soever knows of one case where a wife was prepared to allow her ex-husband joint custody and about 58% residence time with the children, but not the 50% he desired. This led to protracted mediation and negotiations. The father suspected the guidelines' magical 40% threshold was the root of the problem. To test his theory, the father asked if the children might occasionally have lunch at home with him on Fridays. "Obviously, a hot lunch at home with a parent was preferable to brown-bagging it in a crowded cafeteria," he says. "This, however, would have put him over the magical 40%. It was not really a surprise when the mother's lawyer responded, 'My client is absolutely not agreeable to your suggestion with respect to the children having lunches.' The mother was prepared to fight a costly custody battle just to retain the 40% threshold. Could there be any more blatant example of the insidious nature of these guidelines?" Ottawa economist Ross Finnie, now an adjunct professor with the School of Policy Studies at Queen's University in Kingston, was one of the developers of the guidelines, but has since published critical articles in the Ottawa Citizen-. "A dubious 'victory' for divorced families" and "Federal proposal may worsen custody, payment programs," as well as a paper, "Good Idea, Bad Execution; The Government's Child Support Package" (caledon@caledoninst.org). Mr, Finnie believes the underlying guidelines are fair, but objects to the custodial parent receiving all the tax credits, His major criticism, however, is the same as Mr. Soever's. The 40% threshold with no allowance for expenses, he says, "came out of the air with no real explanation. It came from within the Justice Department. Some people were top-notch, working with technically difficult concepts such as 'What does a child cost?' and just wanting to do the right thing, but that was not uniformly the case. I suspect someone said, 'How can we ratchet up these awards a little bit?' Let's just say," he smiles enigmatically, "It ended messily between myself and the Justice Department."